This rebounding drill stresses the basics of boxing out, being aggressive, and making the outlet pass, and "finishing" on the offensive glass. 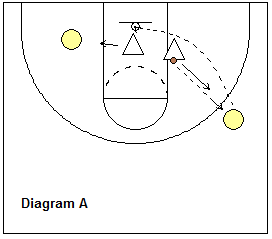 Setup: See the diagram... two rows, one on each side of the free throw lane. The first player in each line becomes a defender and moves down by the blocks and will box-out the next player in line. The next player in each line are offensive players. Have a player at each wing for the outlet pass. The coach, or manager, shoots the ball from the free-throw line. The coach shoots. The defenders box-out, rebound, make the outlet pass and the next group takes over. The two defenders rotate to the outlet positions, and the outlet players go to the back of the offensive lines. Offensive players should be aggressive, try to get the offensive rebound, and power it back up to the hoop. Play until either the defense rebounds and outlet passes, or the offense rebounds and scores (limit offensive possessions to 6 seconds to keep the drill moving). Then rotate to the next group. Offensive players now are defenders. Make sure all players hustle, are aggressive and are using good rebounding technique... with proper boxing out, attacking the ball, and making a good outlet pass. If the defense fails to secure the rebound, both players run a lap. Offensive players should be aggressive and power the ball back up to the hoop, scoring quickly (within 6 seconds). If the offense scores, they have "immunity" for when they go on defense. If, when they are on defense, they successfully get the rebound, they keep their "immunity" for the next time. If they fail to get the rebound, they lose the immunity, but don't have to run that lap. An offensive rebound with failure to score is nothing, no immunity. You can also run this drill with just one line, one defender and one outlet receiver. 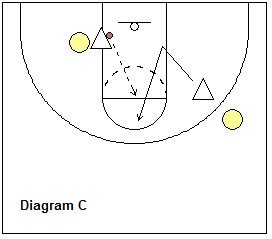 This a helpside, close-out and box-out drill. Start with the ball on either wing, with the opposite wing defender in helpside. When the ball is skip-passed, the helpside defender closes-out. X2 sprints to helpside. O3 shoots and O2 goes for the back-side rebound. 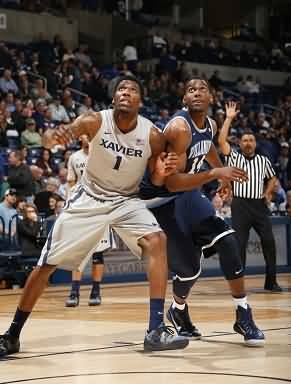 X2 must find and box-out O2 and rebound. X3 must box-out the shooter (without fouling). Rotate offense to defense after several shots, using both sides. 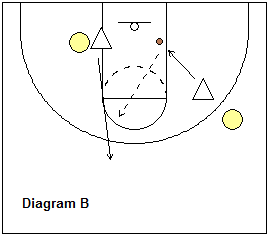 This another helpside, close-out and box-out drill. One offensive player is on the opposite low block area and his defender is in helpside in the paint. The other offensive player is on the wing. His defender starts at the block, passes it out to the offensive player (who will shoot the ball), and the defender sprints out and makes a good close-out and then becomes a rebounder. When one defensive player secures the rebound, his teammate sprints out for the outlet pass (diagrams B and C) and they go to half-court, and then we start the drill over. The post defender in helpside finds and makes contact with his man, and makes a good standard, strong box-out inside (usually by using a reverse pivot after contacting his man). The perimeter defender does not use a standard "box-out", but instead "checks" his man with a forearm and then releases quickly to pursue the rebound. If he gets the rebound, his teammate sprints for the outlet pass (diagram B). We want to see a good close-out. You can start the drill three ways... (1) as above with the wing taking the 3-point shot, (2) the wing makes a shot-fake and a one dribble jump-shot, or (3) have the ball start on the wing with offensive player in triple-threat and he either shoots the 3-point shot or makes a dribble to a shot.